Boeing Co. won an $11.3 billion order from Vietnam’s only private airline, dealing a blow to rival Airbus Group SE in a battle over the growing market for low-cost air travel in Asia. VietJet Aviation Joint Stock Co. will buy 100 737 Max jetliners, the budget carrier said Monday during a visit by U.S. President Barack Obama. The deal will add diversity to a fleet that has consisted entirely of Airbus planes. “That’s a decent surprise,” said George Ferguson, an analyst with Bloomberg Intelligence. The order adds to Boeing’s 2016 lead in the single-aisle aircraft market as the Chicago-based company looks to make up ground after Airbus built a commanding edge in recent years. The jetmakers are rolling out competing narrow-body models — Boeing’s 737 Max and Airbus’s A320neo — to capitalize on growing demand for global air travel. Boeing’s win with VietJet marks a shift for discount carriers that typically stick with a single aircraft type to reduce costs for spare parts and pilot training. The airline, which is less than five years old, agreed as recently as November to buy 30 A320neos valued at $3.6 billion at list price, topping up an order for 100 placed at the 2014 Singapore Airshow. The value of the Boeing deal is also based on list prices. Carriers typically negotiate discounts on plane deals. Airbus, based in Toulouse, France, said it counts VietJet “as an existing customer for our A320 family,” while noting it typically doesn’t comment on airlines’ purchases. The new 737 Max 200s will be delivered starting in 2019, VietJet and Boeing said in a joint statement. 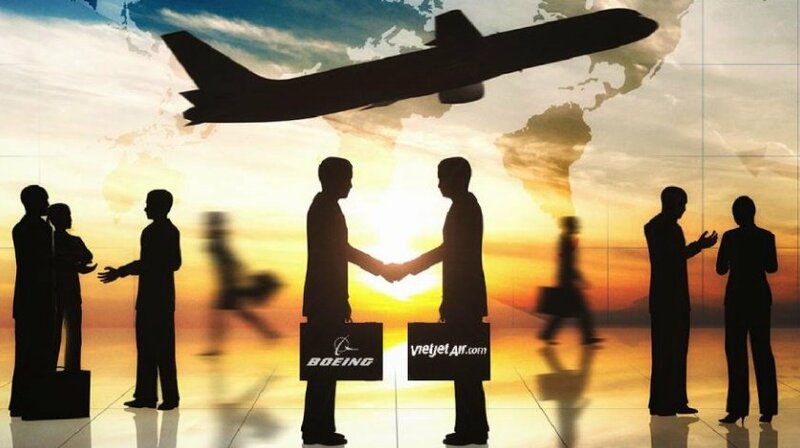 Talks with Boeing began when a Vietnamese delegation visited the U.S. in July, according to Dinesh Keskar, the U.S. company’s senior vice president of sales for the region. VietJet offers more than 250 flights a day on about 50 routes to countries such as Thailand, South Korea and China. The Max 200 variant, which has won orders from Irish budget carrier Ryanair Holdings Plc, can accommodate about 200 seats, with the higher capacity generating better economics at the possible expense of passenger comfort. VietJet’s purchase could signal its intention to model its business on Ryanair’s, Ferguson said. VietJet, tapping a market that’s grown 20 percent annually for the past three years, may also be concerned about whether it can get A320s fast enough to meet growth targets, said Shukor Yusof of aviation consultant Endau Analytics in Malaysia. The Airbus plane has struggled with an engine-cooling issue that led customer Qatar Airways to refuse deliveries until the turbine is fixed. The VietJet deal adds to a 2016 narrow-body order book that previously stood at 140 737s, compared with 88 A320s, according to data from Bloomberg Intelligence. Boeing is looking to make up ground in the market for new narrow-body jets. The company has sold about 3,000 of its new plane, while Airbus has won orders for roughly 4,500 of its competing A320neo. The low-cost market in Asia accounts for a growing number of the orders as carriers such as Lion Air of Indonesia and India’s IndiGo look to improve their fleets. “I see no danger of Airbus losing its edge in the low-cost carrier segment in the Asia-Pacific,” Yusof said. CFM International, the joint venture between General Electric Co. and France’s Safran SA that makes the engines powering the Max, said the new VietJet order for its power plants was valued at about $3 billion.